Hey there! Today I want to talk about packing for a trip! 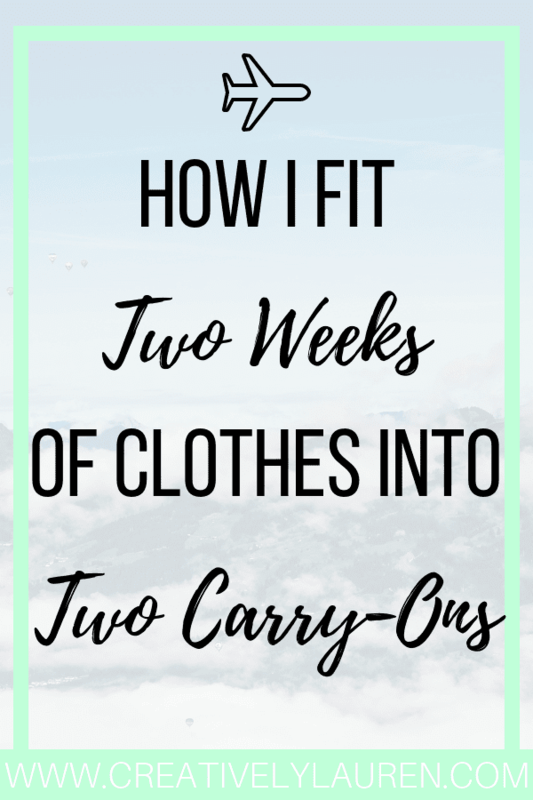 Recently, I shared about my two week trip to Dallas, and I packed my two weeks of clothes in two carry-on sized bags, which I was very surprised I could do. We don’t have a checked bag sized bag, our old one broke, so I had to use our two carry-on bags. I was nervous, thinking I wouldn’t get everything to fit, but I did! So, I originally was just going to fold everything and squish it into my suitcase, trying to put most of my thicker clothes and my shoes in the carry-on bag that I was going to check. Then, as I was talking in my new-hire text group chat, one of my co-workers mentioned rolling clothes. Yes, rolling clothes. I figured that rolling clothes would take up more space than just folding them flat, but that’s not the case! So the secret is to roll your clothes and to roll multiples up at the same time to minimize wrinkles. So in my two bags, I packed a pair of boots, a pair of ankle booties, a pair of converse, five work pants, two pairs of jeans, ten work shirts, five undershirts, five regular shirts, pajamas, all-weather coat, three cardigans, a blazer, socks, and underwear. I know, a lot, and that’s just the clothes! I had to bring toiletries and my laptop as well. I basically packed two sets of clothes, work, and regular clothes. The hotel had laundry, which was great, but I didn’t mind bringing two weeks worth of work clothes. I put all of my shoes, and most of the thicker work clothes, like my pants and cardigans, in my checked bag. I made sure to pack two days worth of work clothes in my carry-on bag to make sure that I had clothes if something happened to my checked bag. (Another pro travel tip if you check bags!) So, most of my clothes were in my checked bag, and it only weighed 35 pounds. I even managed to fit my all-weather coat in my already stuffed checked bag at the last minute by rolling it, which I did not think was going to be possible! Now, when I got the advice to roll my clothes, it was after I packed, so I did have to repack my bag and I didn’t end up rolling my pants on the way out because it was so late at night that I didn’t want to do it. But, I rolled every item of clothing on the way back home, including my pants, and I could tell that it saved even more space. This could work if you have a standard checked size bag, but if you have to put a lot of stuff in a carry-on, this tip could be very helpful. Rolling clothes definitely helped me bring two weeks of clothes in my bags for my work trip. I will keep using this tip, and hope you do too! Have you heard of this tip before? Let me know in the comments!